Bedlam Paintball, Exeter,Poltimore is a totally unique venue featuring urban warfare and close quarter battles within and around the grounds of a World War 2 Bunker and a Cold War Nuclear Bunker! Whether you are new to combat games or an experienced veteran, our Paintballing, LaserTag and SplatBall events are an experience to remember for all ages from 8 and up. 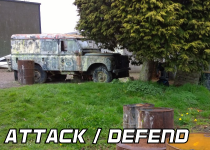 With competitive prices, excellent facilities, friendly staff and a mind-blowing environment to play around in, Bedlam Paintball is your venue of choice in Exeter Poltimore. 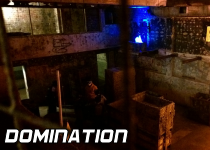 Bedlam Paintball, Exeter, is a totally unique venue featuring urban warfare and close quarter battles within and around the grounds of a World War 2 Bunker and a Cold War Nuclear Bunker! Whether you are new to combat games or an experienced veteran, our Paintballing, LaserTag and SplatBall events are an experience to remember for all ages from 8 and up. With competitive prices, excellent facilities, friendly staff and a mind-blowing environment to play around in, Bedlam Paintball is your venue of choice in Exeter Poltimore . Whilst mixing all age groups is a common practice at paintball venues and Bedlam is no exception, we do appreciate that some people want to play amongst others of their own age group. We offer a couple of different options for adults to play exclusively together. First, you can request an exclusive group if you have 20 players or more, guaranteeing you will only play with those people you bring along. Second, on the first Sunday of each month, we run an Adult Only event where all players must be aged 18 or over. This monthly special event is designed to provide maximum enjoyment over a full day of paintballing delivered at a more relaxed pace, but ensuring the very best of intense action on field. Paintballs, a hot lunch and all equipment are included at a discounted rate. There is no minimum group size and spaces are limited to ensure a great day out. So all you have to do is book in, turn up and enjoy. Attack the enemy Objective whilst defending your own from their deadly raids. You will face several waves of bad guys. Gain control of the Objective to win. If you've seen the Bathroom Scene in The Rock, then you'll appreciate this one. 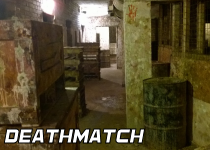 Dominate the Flag Point in the dark depths of The Pit to win this game. One Objective in the centre of this map and two teams battling it out for control. This a tough and favourite classic game at UCZ. Only the brave will be victorious. All guns blazing for the Team Deathmatch. Wipe out the opposition forces completely to come out on top. With respawns thrown in, this is harder than it sounds. Bedlam Paintball Exeter Poltimore . 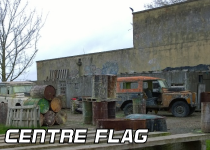 The best paintballing Deals in Exeter Poltimore. Go Bedlam Paintballing Exeter Poltimore is a pay as you go package to play paintball in Exeter Poltimore. The package includes entrance fees, game fees, paintball insurance, paintball marker gun, paintball hopper and propellant for the whole day.